TC Track Club is actively involved in supporting local schools, organizations, and individuals related to running. Through the events TC Track Club hosts, (Frozen Foot Race, Race Walking Clinic, Bayshore Marathon, Summer Series, Remembrance Run, Farmland 5K, Frozen Foot, and Jingle Bell Run) we are able to generously give back to our community. As of the 2017 Spring Grant cycle, the amount we have granted has exceeded the $1.5 million mark! Some of the recipients include: Traverse City Public Schools Cross Country and Track & Field Programs, TC St. Francis, GT Academy, TART Trails, VASA, Hickory Hills, Mt. Holiday, and the Women’s Cancer Fund. TC Track Club also established an endowment with the Grand Traverse Community Foundation, and the NMC Foundation which will fund grants and scholarships for many years to come. Additional community support comes in the form of consulting and providing support for small startup running and walking events through the community. 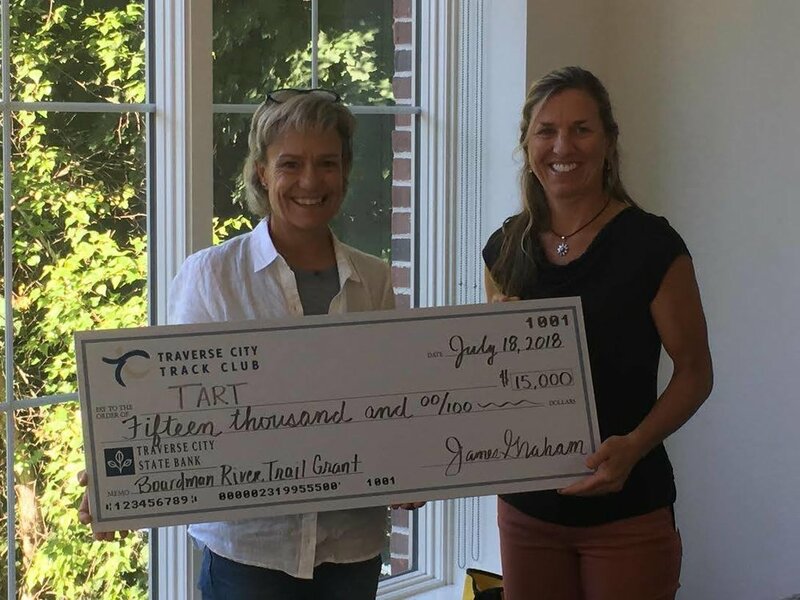 TART trails development and maintenance of trails, including over $75,000 towards the development of the Leelanau Heritage Trail. Remembrance Run remains the largest fund raising event for the local Women’s Cancer Fund, providing over $250,000 to the fund through the event the past 23 years. The Traverse City Track Club Endowment was established in 2010 by the Board of the Traverse City Track Club who had a vision for and commitment to the long term ability to support the charitable giving efforts of the Club. The Traverse City Track Club Endowment supports grants for programs and activities that promote, support, and encourage running, race-walking and walking as a means to promote health, enhanced fitness, family recreation and competition for all individuals. The TC Track Club Endowment is both a Spring and Fall Grant Cycle Opportunity. The grants are available to qualified non-profits in Antirm, Benzie, Grand Traverse, Kalkaska and Leelanau Counties.